Working with attorney Marc Toberoff, who is also the legal representative of the Siegel and Schuster heirs suing DC Comics to regain the rights to Superman, the Kirby Heirs filed an appeal of Judge McMahon’s decision in 2011. Superheroes are very popular right now, but it can be easy to forget how poorly things went for many of their creators, such as Jack Kirby here. Sadly, it’s not going well for the heirs of those creators either. In new research, University of Texas professor Douglas Bruster analysed a sample of the playwright’s famously scrappy handwriting to identify very strong similarities between it and the hand that wrote the play’s so-called Additional Passages. So it looks like Shakespeare possibly wrote some of one of Thomas Kyd’s plays. On the one hand, I find this fascinating. On the other hand, I get so grouchy at the “Who Was Shakespeare Really?” conspiracy theorists, I wince at Shakespeare articles now. Oh well. Maybe we can all calm ourselves by watching this clip from Hamlet with David Tennant and Patrick Stewart and Penny Downie. What else could you possibly need today? “As far as I’m concerned, the greatest stories I grew up on all have their good, scary, frightening bits,” he said, with a nod to C.S. Lewis’ The Chronicles of Narnia and the original fairy tales by the Brothers Grimm. Neil Gaiman did an interview with CBC’s Radio Q, which is always a delight, and does its job nicely by reminding me that I really need to get my hands on The Ocean At The End of the Lane already. Illuminate your patch of ground. 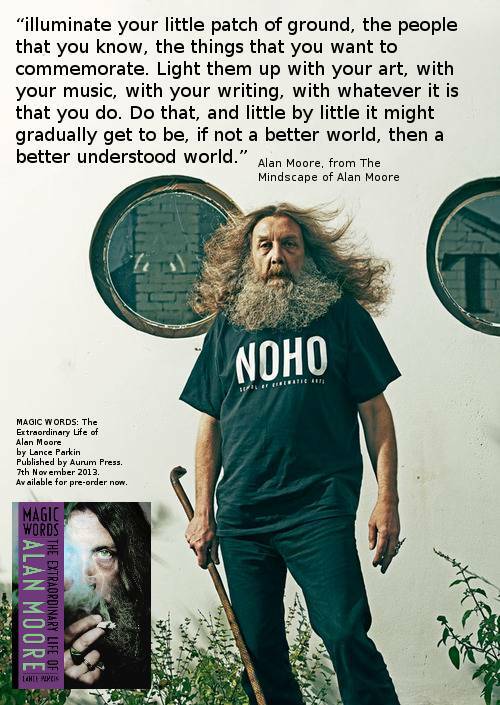 A photo and a quote from the upcoming Magic Words by Lance Parkin, which will be the first in-depth biography of comic book lord and master Alan Moore. (I like to imagine that his hair looks and moves like this photo all the time, even in closed rooms).